Eucharisteo. I knew choosing this word, this blending of grace, thanksgiving, joy, would challenge me. Three weeks into the new year and yes it is challenging me even more than I anticipated. This post, though, isn’t about that. Today I want to share how I’m keeping my word for 2011 in the forefront of my mind and thoughts. Beautiful & artistic ways to keep me focused as well as practical and introspective tasks. The first is the beautiful. Lisa Leonard is my favorite jewelry designer. Her designs are simple yet meaningful. Perfect for my style. So just as I did last year I ordered her Word of the Year necklace with my word. I know I will wear it often as I did the one from last year. 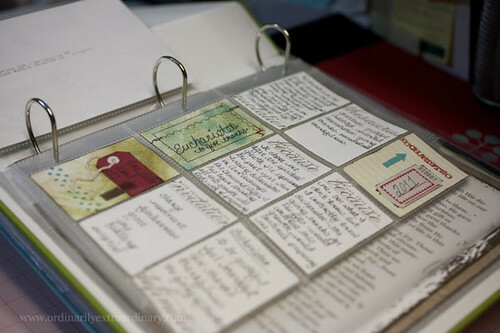 I was so excited when Ali Edwards announced her One Little Word class at Big Picture Scrapbooking. I love to scrapbook and the Yesterday & Today class she taught at BPS was amazing. Being the favorite scrapbook artist I follow, I know I’ll follow through with the One Little Word class. A canvas art piece is also in my plans. I recently discovered Evernote. Downloaded to my computer, iPad as well as my Droid I set up a notebook just for listing “One Thousand Gifts” making it extremely easy for me to list the gifts God sends. Evernote syncs the updated notes among the three. While I would love to be able to write them down in a beautiful handmade journal it’s not practical for me to carry around a journal all the time. My phone is always with me though and Evernote makes it easy to keep my list of gifts. And of course I plan on blogging updates with my thoughts and perhaps sharing some of the gifts on my list in those posts. All in hopes of keeping myself accountable and staying focused on my word. I’ll be back to share more soon. Have you chosen a word for 2011? If so how are you keeping focus on your word? 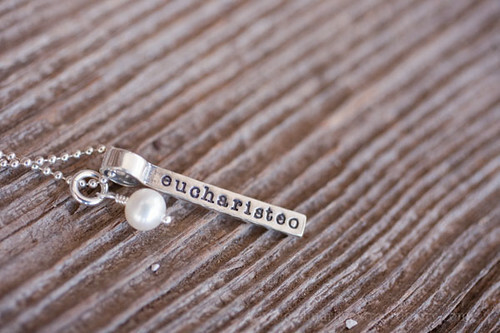 Can I just ask you how you got “Eucharisteo” on your necklace? I just tried to order one as it is exactly what I am looking for … and it is too many characters. I guess I could try to contact Lisa, as well, but thought you might give me a tip. Thanks … and just LOVE the necklace!! I love your nine-slot page pictured here. It reminded me that I have more supplies available to me for chronicling and scrapping my personal journey. Thanks for being open about your own journey! It’s inspiring to have others walking with us.